I was fortunate enough this week to be voted into Time Out’s ‘The Culture 100‘ Art and Design section, devised with The Hospital Club. It is a search for the most original and influential people in the UK creative and media industries. You will also see in the image below I am growing a ‘Mo’ for Movember for a charity I support and am brand ambassador C.A.L.M to reduce male suicide in the UK. You can support them through their website. I think that is a BOOM! allround. I was fortunate enough to go and visit Beijing a few weeks ago, experience wonderful food and such unbelievable places as the Great Wall of China and the Forbidden City. During my stay I hung out with a good friend and his mother, a chinese calligrapher. 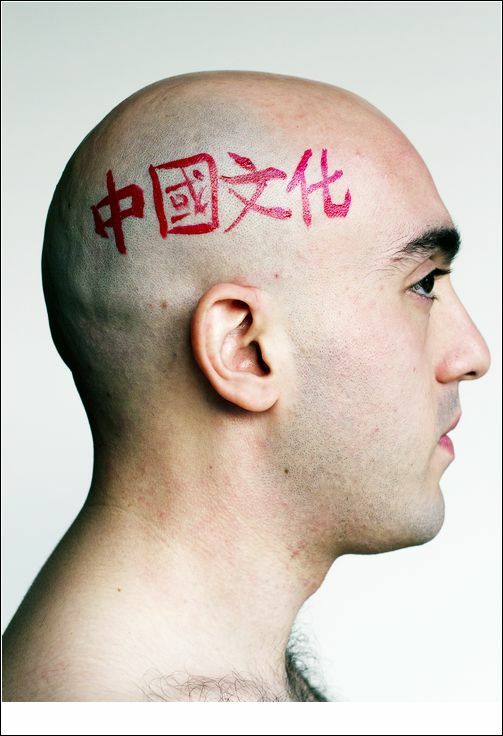 We went onto collaborate and do a few designs on my head, my favourite being this one which from what I was told says ‘Chinese Culture’. Thank you to Esther ‘Godmother’ Tung for doing the design. I had much fun. Time Out and The Hospital Club’s hClub100. Vote for me. 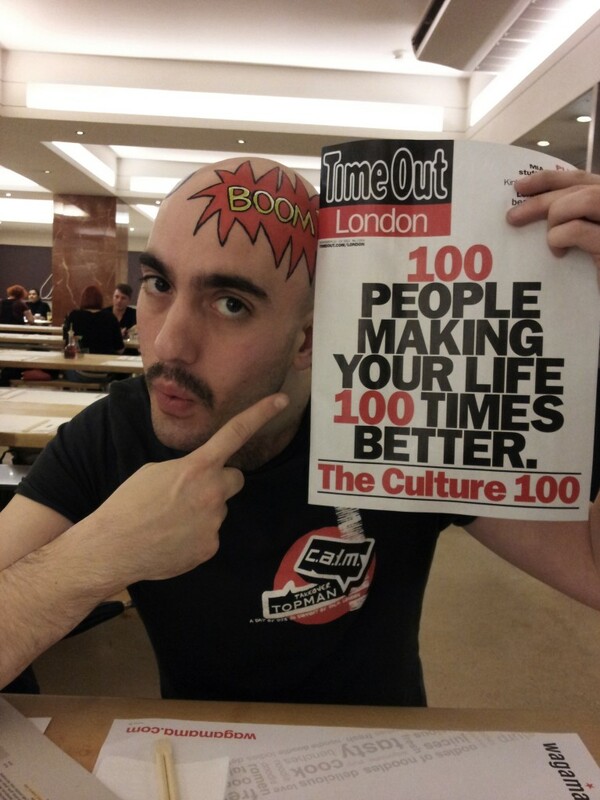 I have been shortlisted for Time Out and The Hospital Club’s hClub100. What does this mean I hear you say? In a nutshell explanation…The hClub100 in association with Time Out London is a national search for the most innovative, interesting and influential people in the British creative and media industries. Agile, brave and adventuresome, their achievements over the past 12 months have made them stand out from the crowd and their contribution is shaping the future of the UK’s creative industries. So there is a 300 shortlist and I am in Art & Design section against such heavyweights as David Hockney, Peter Blake (Sir to you and me) and Thomas Heatherwick. This will be voted down to 100 making Time Out’s magazine issue in November. So if you want to help me reach the dizzy heights of the 100 click HERE scroll down to my name (alphabetical order), click on the tiny box to the left of my name, then scroll down to the bottom, click vote and follow the easy instruction. Then lets us pray! Thanks for your support no matter what side of the fence I eventually end up on. 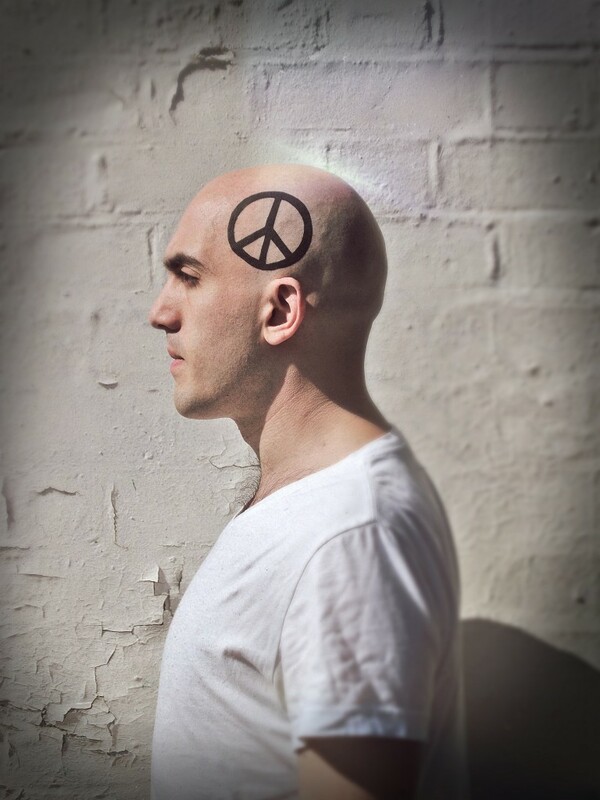 I was recently asked to produced a Peace Head to support Art Below‘s The Peace Project. 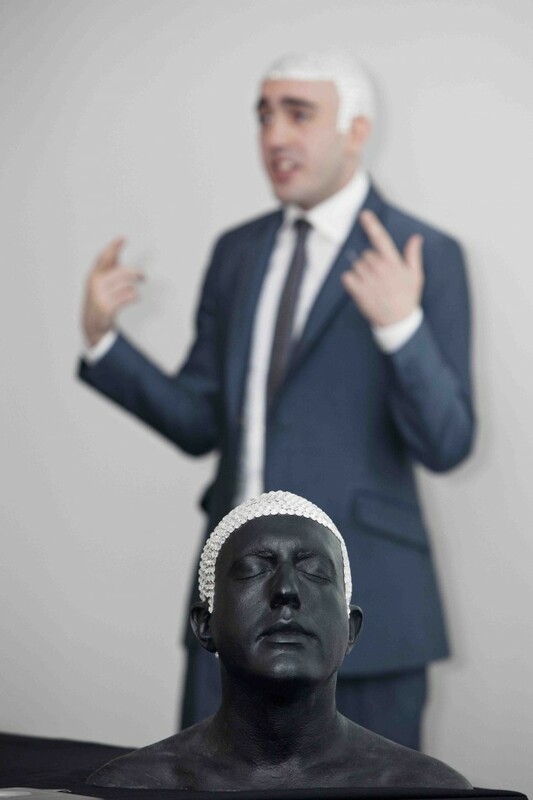 I worked with Daniel Chidgey who photographed the images and added some artwork to the piece. We had various ideas and came up with these two images, simple and to the point. 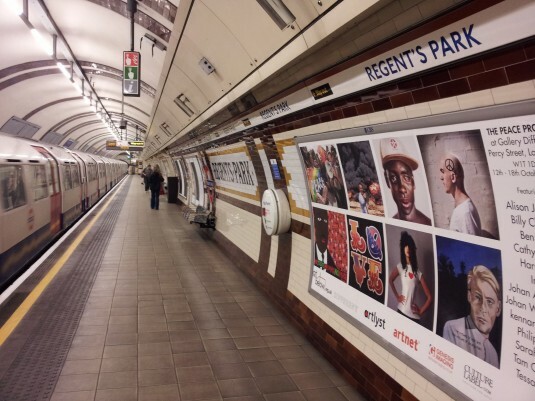 As you can see the image was shown in Regents Park Tube Station as part of Frieze Art Fair. Following my previous post about my involvement with CASS Sculpture’s ‘Art Outside’, here is a picture of my art work being projected from the JCDecaux digital screen in the newly renovated Kings Cross Station. The same image is being seen in other London and UK wide stations. 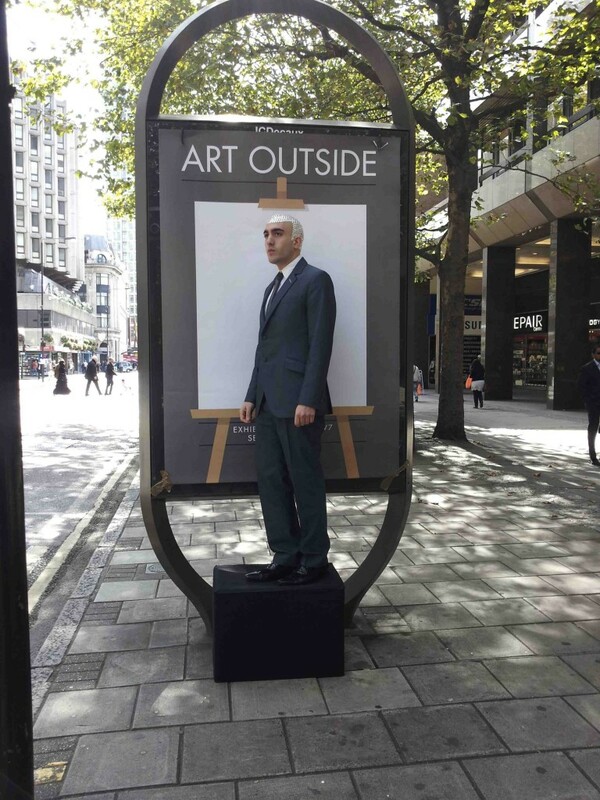 As part of an event hosted by CASS Sculpture Foundation, JCDecaux & BBH artists were asked to come down and draw, or in my case display their art work on a billboard. I was asked to launch the event and as you can see became ‘Art Outside’. (Second photo taken by Ross Cooper). 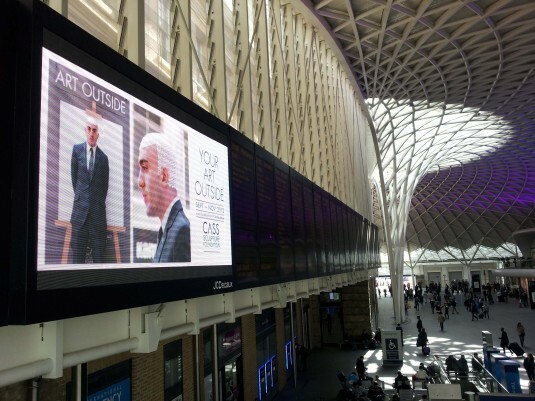 All the final images produced by artists were seen in stations across the UK through JCDecaux digital projection screens during September. As mentioned in a previous post I was privileged enough to be invited to put on a workshop for the Tate Collectives. Please find photos of the day taken by Donald Michael Chambers and big support by my fabulous friend Gigi Morley (3rd picture down, lady on my left). 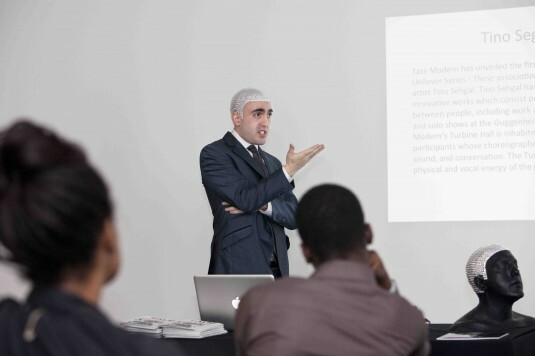 I spoke to the 15-25 year olds about Still Art Vs Interactive Art and they then were able to wear bald caps and practice designing on their heads like I would when developing my ideas. Great day and great fun. I hope to do more! 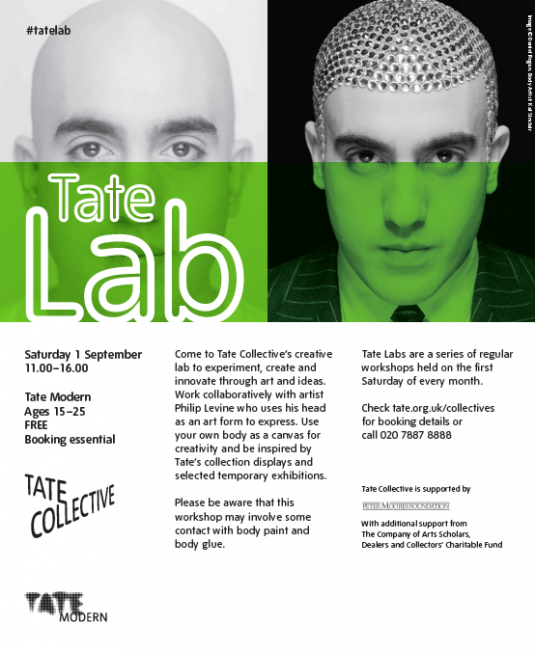 I have been fortunate enough to be invited to do a talk and workshop at the Tate Modern for their Tate Collectives. This is to inspire and show my working process to 15-25 year olds who in essence are interested in art. I very much am looking forward to the experience. All in a life’s work I should really say. Its on Saturday 1st September 2012. 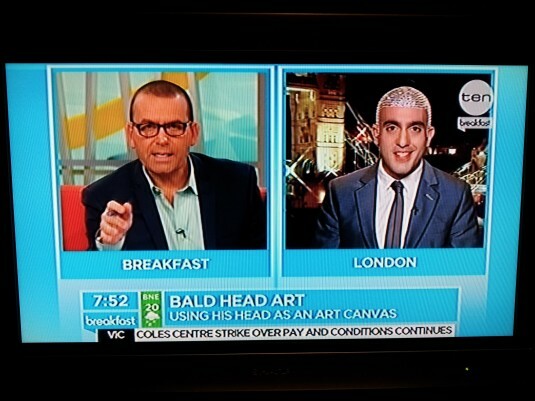 I was recently interviewed about my head art live and direct to Australia’s main breakfast news show, Network TEN. It was great to spread the message to a new audience the other side of the globe. What was even more special about it was the email I received 24hrs later from little Jesse. Will need to fly over to Oz soon. Find letter, image and video of the interview. Enjoy. My name is Jesse and I live in Perth, Western Australia. I am seven years old and I have complete alopecia like the boy in America. 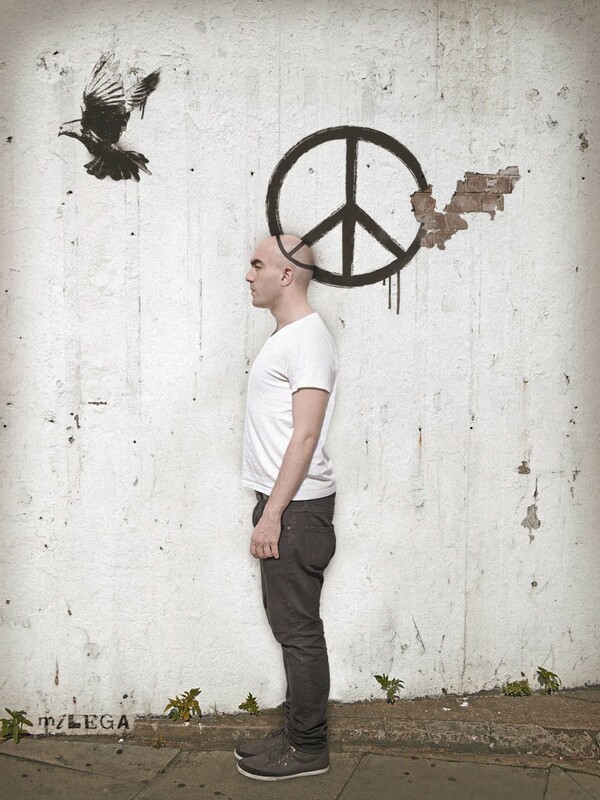 I saw you and your awesome art on television one morning and my mum said that would be cool for me because sometimes I find it hard to take my hat off and then we saw the boy with alopecia. 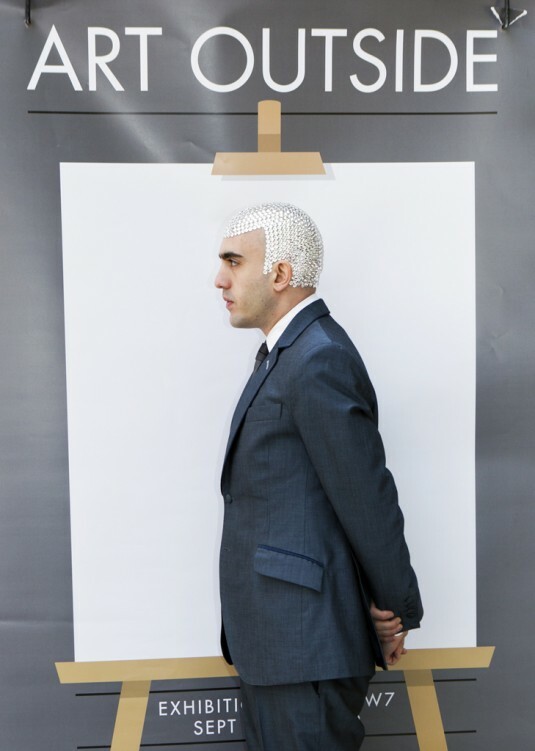 If you ever come to Australia can you let me know because I would love you to use my head as an art space it would mean a lot to me. I was chosen to be part of a documentary looking for the most original people in the UK, supported by Stoli Vodka. The short film was shown at the Sundance Film Festival in London. Hope you enjoy.